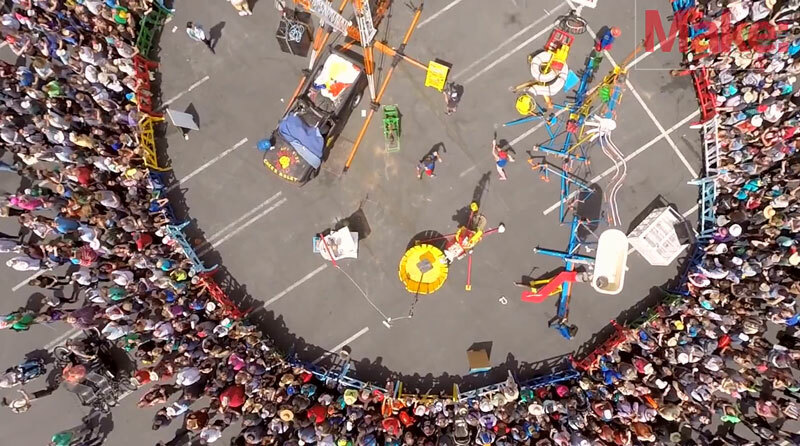 Aerial shot of the Bay Area Maker Faire 2014 from 3D Robotics using their IRIS autonomous aerial vehicle. Maker Faire, held at the San Mateo Event Center May 17-18, was the biggest Maker Faire Bay Area to date with over 1,100 makers exhibiting their projects, hobbies, products, and innovations. There was also over 200 presentations from the maker movement’s experts, thought leaders, and motivators across eight stages; and the widest variety of topics on tap illustrating the movement’s breadth and depth. Over 130,000 attendees reveled in all that was offered to them to learn, see, do, and gain inspiration from at the Faire including learning how to use 3D printers to make useful items at home or for their business; seeing how fashion and technology are merging to create intelligent wearables; learning how to get started with Arduino, Galileo, and BeagleBone; and so much more. “People are experiencing a real change in how they view themselves and others as makers and catalysts of innovation, no matter the topic — robotics, sustainability, 3D printing, homesteading, space; you name it and people across the globe are changing the way those things are developed, shared, and produced. Maker Faire is so proud to be the place where makers of all types, ages, and skill levels come to be inspired and take their making to new heights,” said Dale Dougherty, president of Maker Media and co-founder of Maker Faire. 3D Robotics shot incredible footage of Maker Faire Bay Area 2014 all weekend long, using their IRIS autonomous aerial vehicle and produced the following video. Enjoy!